Experts from Birmingham City University have launched a unique knowledge sharing project aimed at tackling flooding in one of the world’s most flood-prone countries - Peru. The international collaboration brings together Peruvian universities, and academics from UK institutions with the aim of supporting vulnerable communities living in high-risk zones across Peru. The initiative was launched after Birmingham City University flooding experts Professor David Proverbs, Roger Wall and Michael Grace successfully secured funding to travel to Peru and host a four-day workshop with groups of experts and researchers, with the aim of improving the South American country’s resilience to flooding. 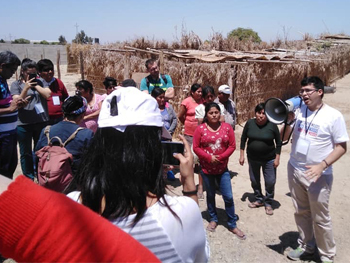 Based in the northern Piura region of Peru, attendees visited some key flooding hotspots and explored how changes to engineering, urban and rural planning, and government policy could help prevent flooding and improve response times in emergency situations. Working alongside the Instituto Geofísico del Perú (IGP), the Universidad de Puria and the Governor of the Piura Region, the scheme hopes to equip officials with new ideas and kick-start a major overhaul of research into the issue, as well as influence future policy. Improved approaches to flood risk management could save lives and prevent the devastation which has seen hundreds of thousands left homeless in recent years. The project will also see a detailed report produced to inform future policy in Peru which could provide vital protection for the country’s most vulnerable communities. Peru has experienced numerous incidents of severe flooding, most recently experiencing extreme conditions and mudslides in 2017, which saw many people killed and hundreds of thousands of people left homeless. 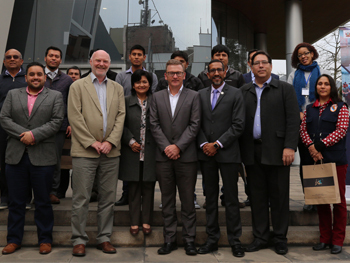 Professor David Proverbs, Associate Dean for International at Birmingham City University, said: “Flooding represents a significant hazard in this region of Peru and it was great to bring together this international and multi-disciplinary team of experts together to help develop innovative approaches to improve future resilience. The exciting proposals developed during the workshop could lead to a step change in the adoption of integrated approaches to living with flooding and towards the development of collaborative, co-produced solutions. Professor Proverbs has pioneered the development of flood recovery in the UK having worked on a number of government funded projects and most recently provided a leading contribution to the latest UK Climate Change Risk Assessment. The new international collaboration has been funded through the British Council Newton Fund Researcher Links programme and has been supported by the British Council, the Newton Trust and the British Embassy. Ongoing contact with Peruvian officials. Birmingham City University’s academics have spent twenty years researching flood risk management approaches across the globe in a bid to help reduce the risk of flooding and support communities in preparing for the impact of such incidents. Other institutions involved in the project include Cambridge University, Newcastle University, King’s College London, St Andrews University, Aston University and Heriot Watt University.